Integra approached us wanting to update their website to be mobile friendly and responsive. They also wanted to switch from the Joomla Content Management System, to Wordpress. When we were designing and developing this website, one of our main priorities was to make the user experience be mobile first. 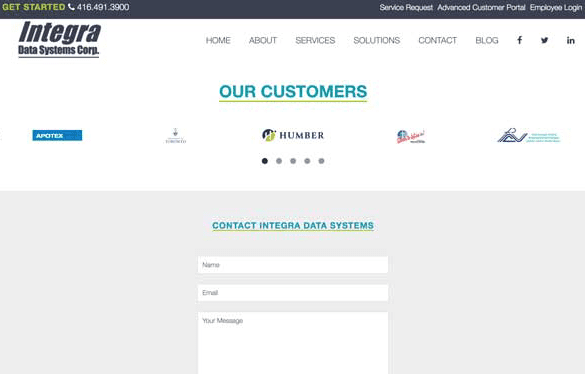 The service catalogue that Integra offers is technology based and many of their potential clients would be accessing this website from their mobile devises. It was also important for Integra to have the ability to make updates to the website easily as well. We create specific content types for the services that they offer as well as the technologies that they are using. Giving them the ability to access the back-end of the website and integrate all of this content. Integra has some very notable clients. It was important for them to have the ability to showcase their clients logos front and center on the website. We gave them the ability to add and replace clients from the back-end of the site with ease.